I am SOOOOOO EXCITED to announce that 2 Cute Ink is Featured in Simply Cards and Papercraft Magazine! You can grab a digital copy of the magazine here! 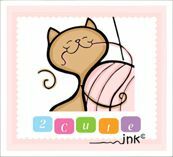 Plus you can download 4 FREE 2 Cute Ink Digital Stamps here in their download section! :) Below is a card featuring one of the FREE digi's "Celebration Penguin" created by Shani Thomas, which made it on the top cover of the magazine! woohoo! So make sure to grab your feeble digital stamps and share you creations in the 2 Cute Ink Digital Stamps Fan Group!